Marla Bennett, a native of San Diego, graduated from U.C. Berkeley in 2000 and was in her second year of her master’s in Judaic Studies in Jerusalem. She was killed July 31, 2002 when a terrorist attack ripped apart Hebrew University’s cafeteria. 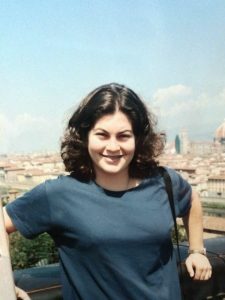 Inspired by Marla’s love of Jewish learning and Israel, friends and family started the Marla Bennett Scholarship Fund, which supports the Marla Bennett Fellowship. The Marla Bennett Fellowship is given to one Berkeley student each year to spend the summer learning at the Pardes Institute. The Fellowship allows students to advance their own Jewish learning and develop their relationship with Israel. Upon their return the fellows organize ways to bring Marla’s memory and their experience back to campus. This year’s fellow, Gilad Barach, shared reflections in the Missing Marla Facebook group. Thank you for supporting the Marla Bennett Fellowship Fund. Your contribution ensures that we can continue sending new Marla Bennett Memorial Fellows to Israel each summer to study in Marla’s memory. I would like to receive the Berkeley Hillel Newsletter.